Talking Tom Cat for Mobile repeats everything you say with a funny voice. You can pet him, poke and punch him, you can even grab his tail.Enjoy hours of fun and laughter with Talking Tom. He is especially fun for children of all ages. Record your own videos of Tom and save them to your library (MMS), share them on YouTube & Facebook or send them by email.Pet his body or head to make him purr.Poke his head, belly or feet. Grab his tail. Record your own videos of Tom and save them to your library (MMS), share them on YouTube & Facebook or send them by email. * Talk to Tom and he will repeat everything you say with a funny voice. * Pet his body or head to make him purr. * Poke his head, belly or feet. * Pour a glass of milk for him to drink. * Forget about him and he will yawn or sneeze. 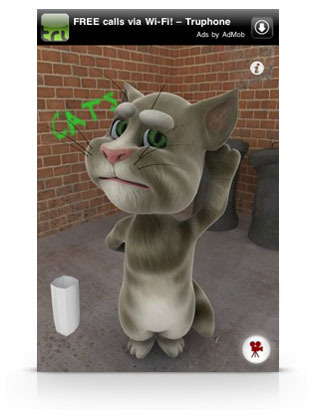 Qweas is providing links to Talking Tom Cat for Mobile 1.7 as a courtesy, and makes no representations regarding Talking Tom Cat for Mobile or any other applications or any information related thereto. Any questions, complaints or claims regarding this application Talking Tom Cat for Mobile 1.7 must be directed to the appropriate software vendor. You may click the publisher link of Talking Tom Cat for Mobile on the top of this page to get more details about the vendor.